Harper was Bullitt's slightly older cousin that foresaw a next couple years of movie cool's progress, while Bullitt exerted influence to last decades. Harper was also among last of recognizably Warner Bros. pictures. Jack L. in fact visited the set to wish cast/crew luck. WB ad/pub team lit fuse here on latter-half 60's where they'd not put a merchandising foot wrong. Harper was a private eye story, and those generally date least. If anything creaks, it might be Paul Newman's performance, one of times (few) where he gave in to fan desire and played Newman the star rather than character actor mired in settings/situations no fun to watch (The Outrage and Lady L then-recent instances of damage to his momentum). Comedy seemed allergic to Newman, though even Cary Grant would have been undone by A New Kind Of Love or What A Way To Go. Harper actually rescued Newman from decline that was well in progress. He'd not had a recognizable hit since Hud, and in fact, five during 1963-65 interim were for most part stink-ups a lesser career could not have sustained. Stars rather than studios in steering seat made for mixed bag through the 60's, hope and expectations seldom met from point when you'd pick a favorite. I'd see Hombre after Harper, then Cool Hand Luke (twice) and think, wow, bring on more of Newman ... but then would come The Secret War Of Harry Frigg ... and Winning. Did Lou Wasserman exert unholy influence on Newman (or his agent) to drive the at-peak star into poisonous embrace of Universal? Similar things would happen with Lee Marvin and Steve McQueen. 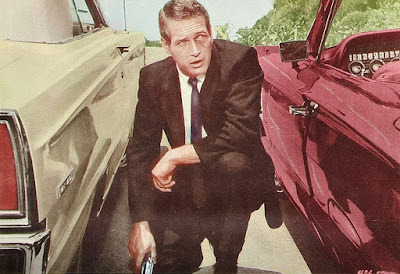 You'd sit with a Bullitt or The Dirty Dozen and imagine vistas of pleasure ahead, but vehicles behind these came on flat tires, thus retreat to freevee and backlog of icons like Bogart or Gable more consistent in their day at pleasing followers. Harper plays well after fifty years. There is jazz scoring by Johnny Mandel that should be, but isn't, available on CD. Some of dialogue is snappy, Harper a first big break for scribe William Goldman, whose book, Adventures In The Screen Trade, tells the background. He and others attribute much of Harper success to a credits sequence where Newman navigates shabby digs and brackish coffee on way to client appointment that sets the story in motion. I'd say if Paul Newman's 60's image had a defining moment on screen, this was it. Just a pity there weren't more films to support it. For refreshing once, he was "our Paul" in contemporary setting and in position to react as we might to Southern Cal kooks and situations that permeated Harper. "See Harper Shoot Straight" said posters that pointed up, knowingly or not, Newman doing just that at long last. He'd be remembered better as Butch Cassidy or for The Sting, but those were period-set, ergo a distance, whatever the coolness factor. 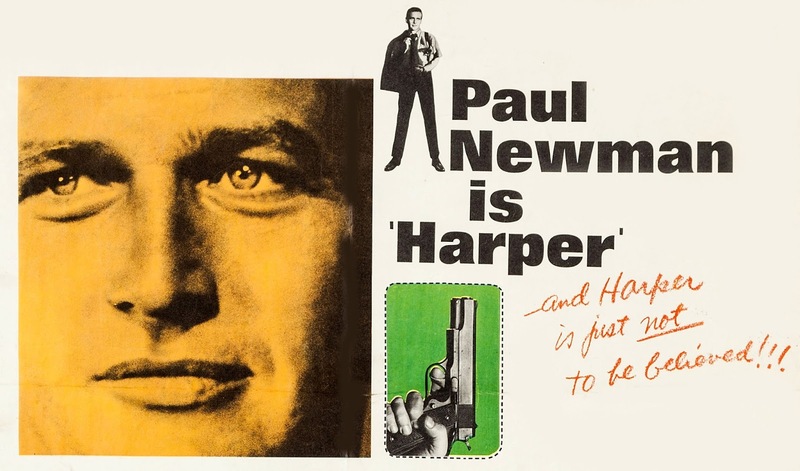 Harper would come closest for Newman to a 60's bulls-eye. It's become my favorite of his star turns. Now if only someone would turn a hand toward releasing the soundtrack. Always read that Newman changed the character's name from Archer for "luck", following Hombre and Hud. More recently a more sound theory offered - that "Paul Newman Is Archer" evoked thoughts of Warner's earlier Errol Flynn and Merry Men. The Hustler and Hud had come before Harper, Hombre the year after, so Newman had a string of H's going, all well-received, his (or whoever's) switch was a sound commercial move. 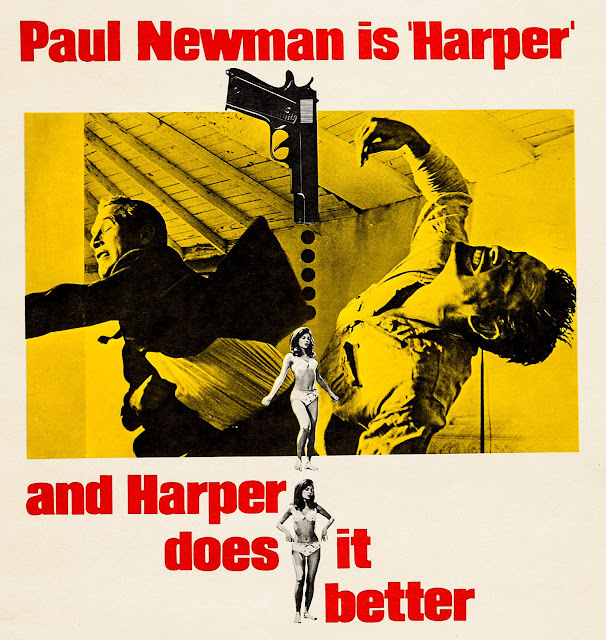 I prefer Harper to Archer for the character name in any case, more loose and befitting "a different kind of cat" (see poster) that Newman plays. Hearing the name Archer in a private eye movie makes me think of Sam Spade's loser partner in 'The Maltese Falcon'. I like this movie just fine, but as a fan of the Ross Macdonald novels, my one bugbear is Newman's performance, which (for me, at least) doesn't capture the character as written. In that regard I much prefer Newman's sophomore turn in "The Drowning Pool" a decade later. Older and a little more weathered by life, he fits Archer/Harper much better for me, although the movie itself isn't as good. The film feels more like a television production than as actual movie and not a copelling one. In this one, Newman is actually annoying and arrogant. The story is confusing and is filled with episodes that play more like erratic short subjects pasted together. I do think the scope helps lend theatrical stature to Harper. Seen flat, it would flop. As to Newman, his performance does at times have a case of the cutes, as in a bit flip for the story's good, but it was Newman giving fans what he figured they'd want, and success of the show would suggest he was right. Dave G, I watched The Drowning Pool a few months back, and did a post, but it hasn't moved up the line yet for publication. 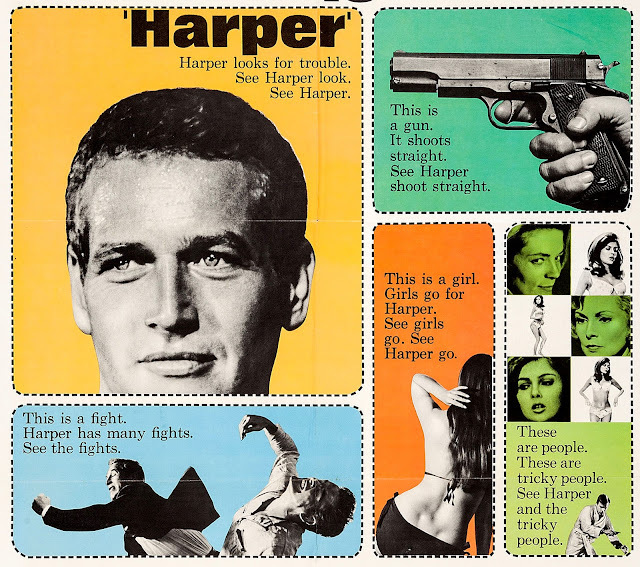 Anyway, I thought Pool was OK, but lacked the fun, free spirit, and 60's vibe of Harper. We had 35mm prints of HARPER available here in North Carolina until the mid-70s and often double-booked it at our drive-ins with a newer WB picture, such as DELIVERANCE, JEREMIAH JOHNSON or McCABE AND MRS. MILLER. I always enjoyed HARPER. THE DROWNING POOL came so much later that my patrons didn't remember Lew Harper. But it gave us a week to get drink syrup off the auditorium floor. The poster designs were extraordinarily brilliant. They did as much as anything else to entice ticket sales. Newman inherited a couple of James Dean slated roles. Could we visualize Dean as Harper? And John, thought I was the only person who referred to some male actors with "a case of the cutes?" Bravo! I think James Coburn's earlier roles exemplifies the phrase. Okay. You got me. After your write-up, I put on HARPER (Warner Instant) while I worked at my desk top. Had not seen it since catching it on a double bill with COOL HAND LUKE back in the 60's. Had fond memories, only avoided it all these years 'cause I could vividly remember the 'who' in the whodunit. Enjoyed it again this time anyway! By the way, speaking of the soundtrack, there's a nifty Capitol 45 of THE THEME FROM HARPER by 'the Gallants' out there, circa 1966. Interestingly, the B side is THE THEME FROM LAUREL AND HARDY. No, really. You can catch listen to either on Youtube! Dean as Harper, Kurt! The mind boggles. But could Jim have relaxed enough to be "kicky" as Paul? Dave, I've dug about You Tube in search of Harper music and have found a number of cuts from the original soundtrack LP, but had not come across this single, let alone the L&H "B" side. I'll have to flush both out. HARPER is a fairly faithful adaptation of MacDonald's THE MOVING TARGET (which was the film's British title) and that's where much of the snappy dialogue came from. Harper, Archer, I have no preference for either name but since Lew Archer was already an established character I thought the name change was kind of a slap in the face to the original author. Brian Keith made a good Lew Archer in an unfortunately short-lived NBC series. John, Dean liked to experiment. He could have gotten a close-cut hairstyle just in time for the 1960's. There are scenes that I could see Dean fitting into. His playful wit shining. Others, it does hurt my brain.